You haven't seen much of me lately, and for that I apologize. But I've been away doing some very extensive research on one of the topics that of course I love, dog food labels. And now it's extended even to the history of dog food. As I sketched it out over a year ago, I've been collecting dog food labels for quite a while, and have found the kind of personal satisfaction from that that really nothing else in life has brought. I hate to be too dramatic, but it might be what I was born for. At that time I listed only a few items from my collection and let it go at that, just gave you a taste. And I'm afraid that's how it's going to stay. Because one of my personal quirks is a terrible paranoia, and it really frightens me that someone is going to break in and steal my collection. So there's no reason to tempt anyone, especially with the combination to the safe right on my bulletin board. Anyway, in the last few weeks, I've been away doing this research. 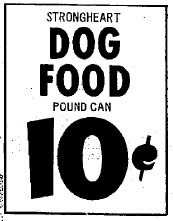 I've been going through an old archive of dog food ads. There's a guy I met through a friend of a friend. Really, he's about as paranoid as me, but with some TLC I was able to soften him up. We went through several nervous weeks of feeling one another out, but finally I gained enough trust to see his archives. He allowed me to photocopy a few of his microfilms, which are below. It's some good stuff! 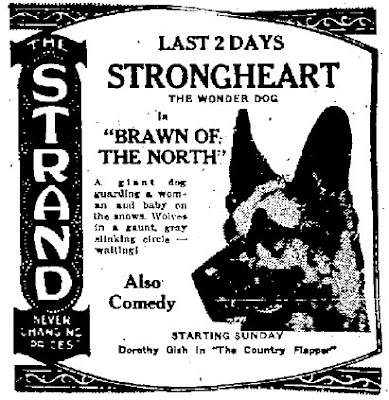 The first one shows Strongheart himself from 1922, the flesh and blood inspiration for the dog food. Strongheart was a movie dog. What I wouldn't give to own his skeleton! Then we get into the actual dog food. 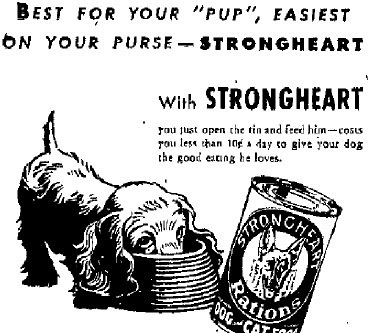 We're going back to 1936 for this next graphic, advertising Strongheart for dogs and cats. I didn't know they marketed it for cats. But apparently they liked it, too, since it said they'd smile sweetly. We'll leave the decade of the '30s behind (for now), and move into the '40s. Here was a good deal in 1941, before our entry into the war, 4 cans for 19 cents! 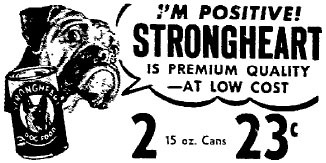 I don't know if that's why Japan attacked us, because they resented our low prices on Strongheart. Also from the '40s, 1947, this is a big ad, which I've reduced. You can't read it, but obviously they started adding Exerol to Strongheart. Exerol is described as "an exclusive enrichment process that adds all the vitamins and minerals that are recommended by government and private veterinarians..." Whatever it is, the ad explains, "Exerol itself is absolutely odorless and tasteless -- in no way affects Strongheart's luscious goodness." That's not a bad price. 3 cans for 27 cents? I could feed the whole neighborhood if it was that cheap now! I like what the dog has to say, "I'M POSITIVE! 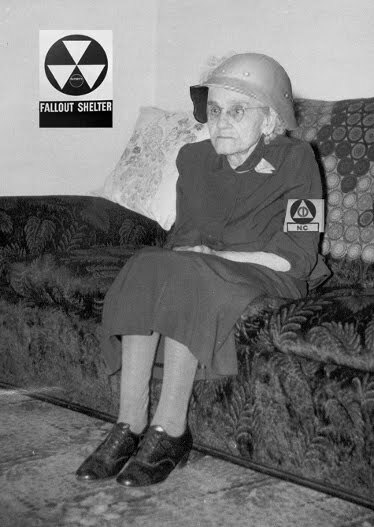 ", reflecting the general optimism we had in the Eisenhower years. 1954 was a big year. Eisenhower built the Interstate Highway System and my brother was born. 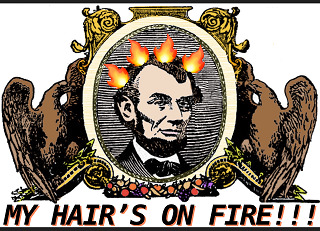 At this point we enter the tumultuous '60s, a time barely fit for man or beast. But of course everyone still had to eat, and that included dogs. 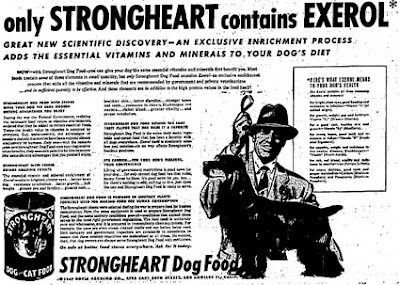 We had go-go joints in the '60s, the Whiskey A-Go-Go, etc., and they even carried it through to dog food ads, saying, "Give your dog go-go-go with Strongheart..." The lettering for PICK-UP also represents the strong psychedelic style typical in 1962, and it even seems to anticipate "Tune in, turn on, drop out" and "Sit ins," a quick phrase like "Pick up." I'll bring it back down with this rather plain advertisement from 1967. It's one of my best memories of the Summer of Love, the great bargains we were getting on dog food. You can see it's stylistically very 1972, and I love the 10 cent font! At that time in 1936, Silver King was on his way to Utah, apparently to direct traffic as a demonstration of his talents. Silver King had met most of the nation's governors, and at this time in 1936, was set also to meet and shake hands with Utah's governor, Henry H. Blood. Silver King had some interesting dental work. Three years before, he'd had some trouble with his teeth. So by 1936 he had two gold-crowned fangs! 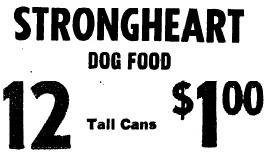 I had a neighbor that used to work for the Strongheart dog food company. He had a garage full of the stuff. I think he was an executive or sales person of some sort. I believe that they finally went out of business around 2009. Not 100% sure of that. My father was a long time "Country Gentleman" in Southern Illinois . He was also a great sportsman and owned Thoroughbred race horses, one of which (My Dandy) had won more than Man O'War by 1938 and he raced until he was over ten (10) years old. He loved to hunt, especially quail hunt. 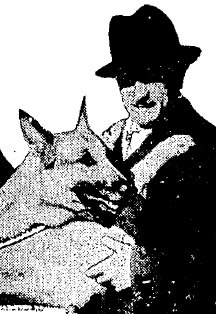 He always kept two English Pointers at his country home (and his only home) which had 6 lakes on 200 acres. He bought Strongheart by the case and, unlike today, the only went to the vet for shots and never got sick. I have not been able to find this for years. Glad I did now and I will be ordering too. Love the name "strong heart". This is a totally true story, but I was strengthened while growing up through abuse by the sight of the label on a box in my closet. Every time I would go to my clothes closet, say three times a day, I would see that storage box on the shelf. When I read "strong heart" it encouraged me not to give up. I became a survivor for many reasons but the memory of that daily fortifying is as clear today as it was fifty years ago . I'm sad to hear of anyone facing abuse, but it's great that you were strengthened, even in a seemingly trivial way, with a label. You had to have had the strength already within you but just needed some little thing to bring it to your awareness. Thanks for your comment, and all the best. 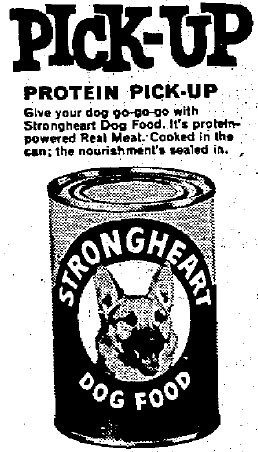 I remember Strongheart dog food when I was growing up. I'm interested in the ingredients that was in the can . Could you please give me that information ,I would appeciatate it. Thank you . Margie Kalligher. I would like to see the ingredients too. 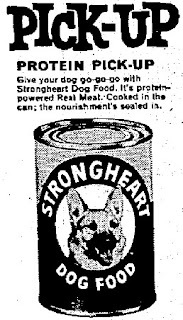 Mu parents bought Strongheart for our dog Boots back in the late '50s.